Enchanting. Incredible. Difficult. Unreal. This words will have to suffice for now my description of the Salkantay Trek to Machu Picchu. In 5 days, 4 nights, I had one of the best treks I’ve ever done as far as beauty and difficulty go. 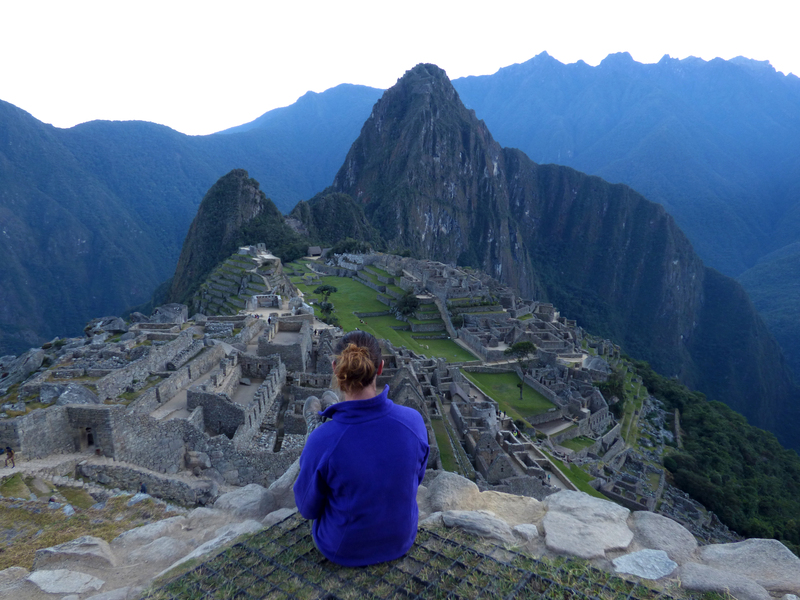 What made this trek truly different, however, (besides Machu Picchu, duh!) was the variety of ecosystems I ascended and descended through. There was cold, mid terrain and sagebrush, mountain top rocks and ice, silver cliffs, jungle, and forests as a start. 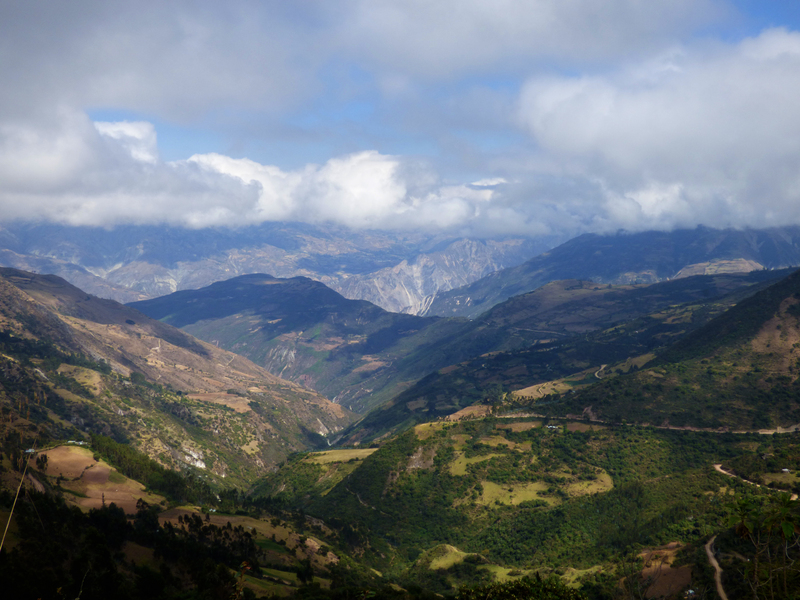 The variety gave me a taste of just how much there is in Peru, and how much there is to experience. Day one started early as we were picked up at our hostel at 4:14 am. It was an early start for all of us, so the morning was pretty quiet. We drove to a nearby town to have breakfast before beginning our trek. Day one was pretty cool. We started at an already high elevation, and hiked 2,000 feet further up. The hills were tall and green, the clouds were hovering for a perfect backdrop, and the air was crisp and cool. From one of our first viewpoints. I could see 180 degrees of mountain after mountain after mountain. It was gorgeous! We walked along the path for a few hours until the first large mountain, Albancay, came in to view. The glaciers at the top were massive and shining in the sun. I also saw a giant, cave-like hole, and we all agreed that we had found the Yeti’s summer home. 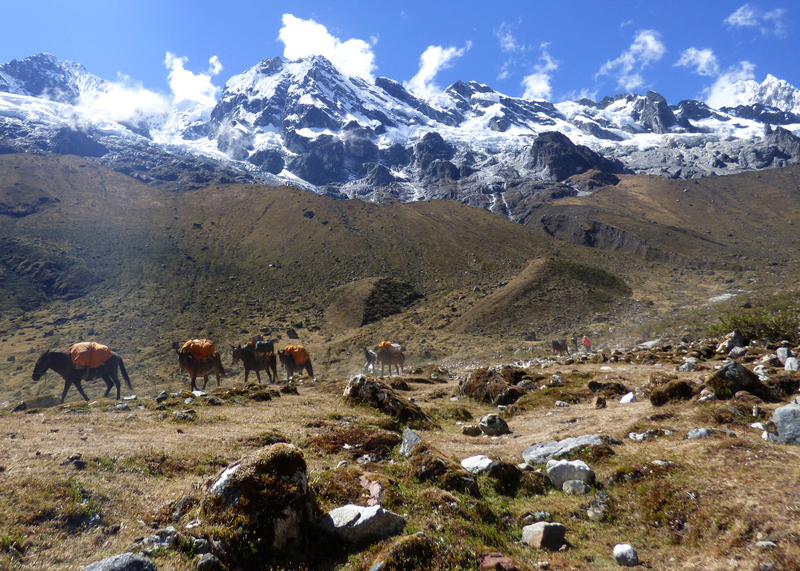 We trekked further until Salkantay also came in to view. Looking at the peaks side by side was an incredible view to take in. They are both massive, and the pass in between was just as immense. Knowing that we were hiking up that the next day was a little bit intimidating. We all sat down to to rest for the last time before hiking the remainder of the path up to our camp. As I stared at the mountain, a HUGE avalanche started! It was large, long, and I even pulled out my camera in time for the last part! It was really cool and happened to be the first avalanche I have seen first hand. I can see why no one wants to get caught in one of those! As we start our trek to summit Salkantay, this view is the valley below as we hike up to our 13,000 foot elevation camp for night one. 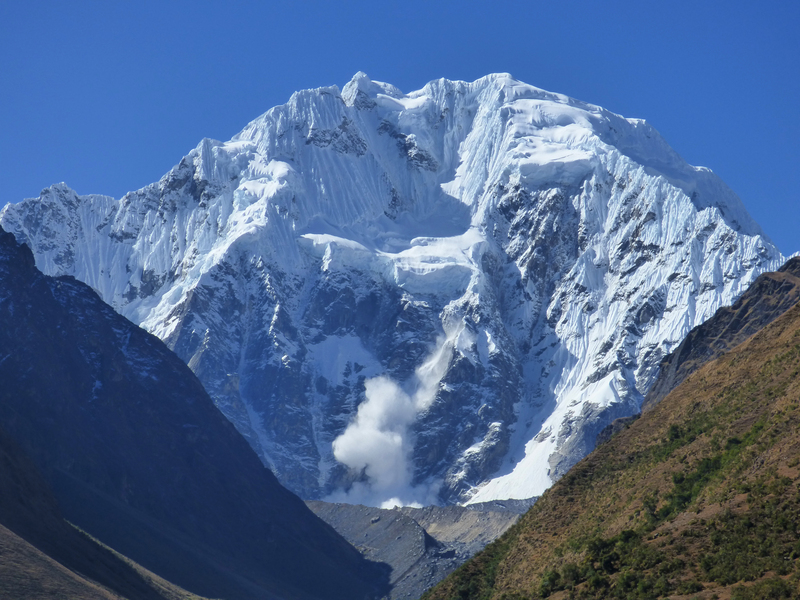 An avalanche comes barrelling down Salkantay Mountain. This is only the end of it. At our first night’s camp, we got our tents, changed, and had a hot soup for dinner. It was a stark contrast to the freezing temperatures that hit! It wasn’t as cold as our trek through Torres Del Paine, but it certainly gave me reminders of how thankful I am to have good gear. The next morning, we were woken up by our guide at 5 in the morning! He was a smart man though, and greeted us with steaming hot cups of coca tea. The stuff works WAY better than coffee! As we ate breakfast, we prepared to take the horses for the day. Chase and his father have only been on horses once before, and I was eager to see how they liked climbing a mountain on one. I grew up on a horse, and I really excited to hop on and ride up! I haven’t been on a horse since the nice cowboy gave me his horse on Amantani Island, and I was all for bonding and sitting on a horse through the worst terrain on the hike. We took the horses up for 4 hours before hiking the last part to the summit. Our horses were truly one of a kind! Gary’s horse was named Viento Andino. In English, this means Andean wind. However, we just nicknamed him Fart. That horse had TERRIBLE gas on the ride up the mountain, and those riding behind him wished they had gas masks. That may be the real reason that my horse, Bob Marley, was so grumpy at him. He took the first opportunity we had and passed Fart and took the lead. Every time Fart tried to pass us on the mountain, Bob Marley pinned his ears and snapped so ferociously that Fart eventually just gave up. Bob Marley is a tough little horse, but certainly not made to be partnered with me. For one, our hips are both at the same level! 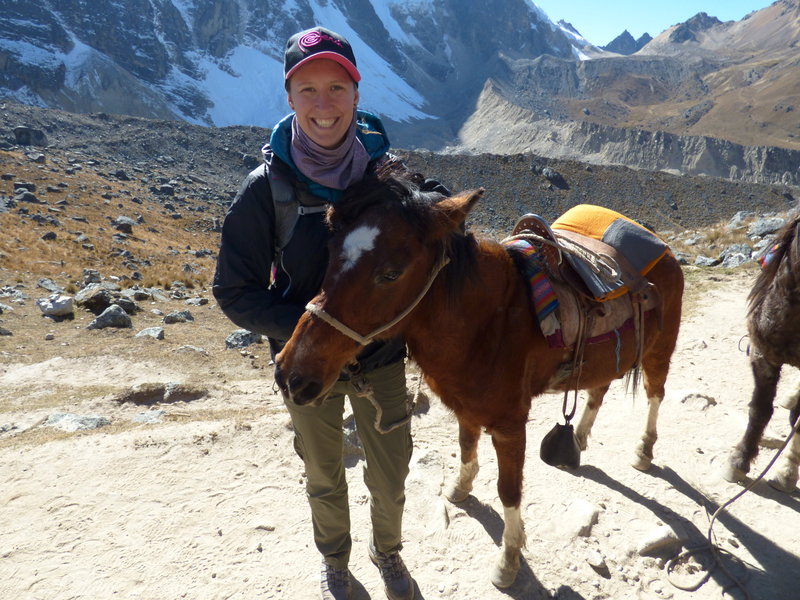 The Peruvians saw that I was the lightest weight and put me on the smallest horse! I was so tall in comparison to this horse that my legs might as well have dragged on the ground through the entire trip! Also, he was so skinny that I could wrap my legs around him and touch my toes together! Obviously, he wasn’t to fond of my size either, because he scraped every sharp rock he could find to try and lose me! The Peruvians insisted that he was the right horse for me when I mentioned the issue, and so I rode him up. He never broke a sweat, and I was shocked! Peruvian horses are tough! Chase’s horse, Serrano, was just a little turd in general. He would charge past us one a one horse lane, almost toppling people off the ledge, just to be first! Then, he would snap and hip check any horse that tried to pass. He clearly wanted to be the alpha-horse and forced his way in to that position! 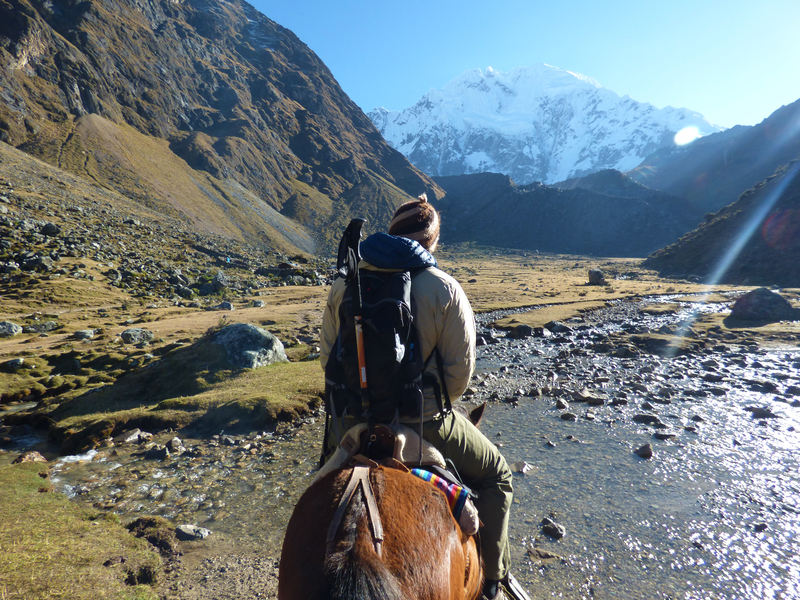 With the three personalities and three riders, the ride up Salkantay was full of laughs and memories. When we reached the summit, it was incredible! 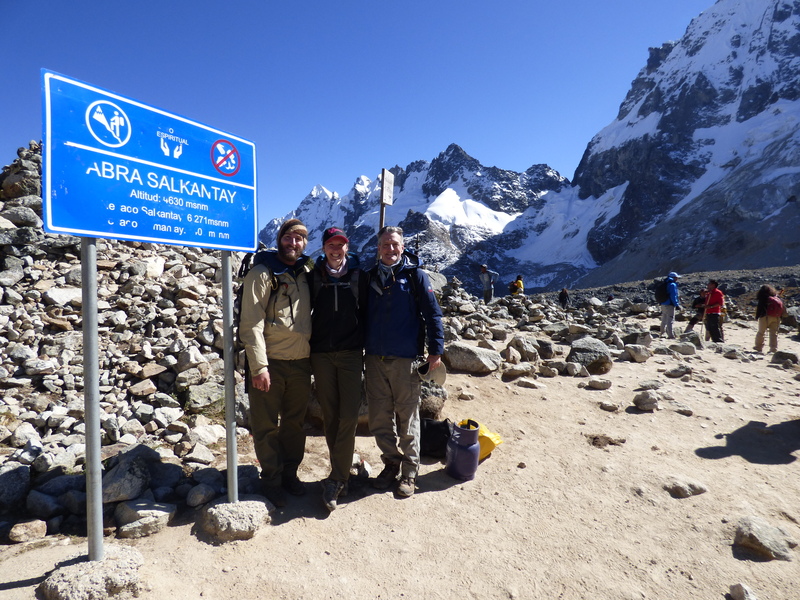 The Salkantay summit is approximately 15,000 feet! We got to the top, took our photos, and Chase and I cracked open our celebratory summit beers, as is the tradition. 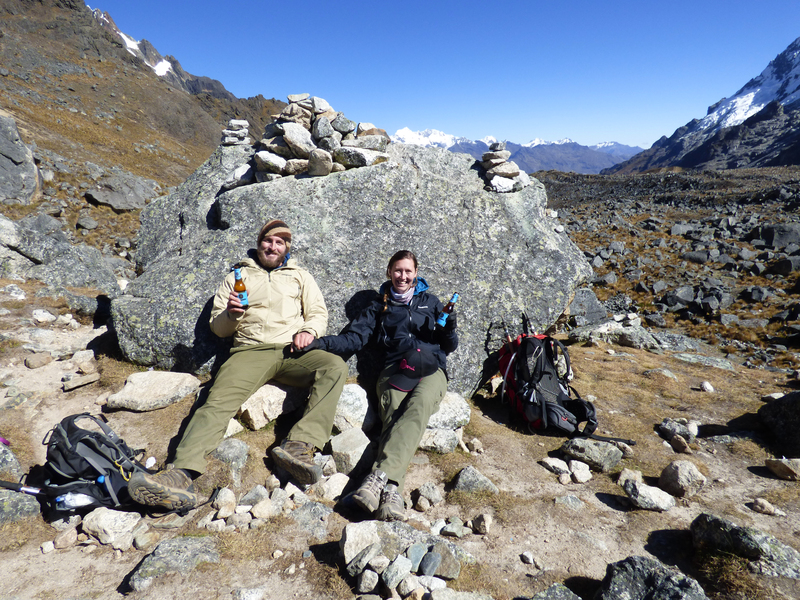 However, we had been taking some medicine to prevent altitude sickness and one of the side effects was the changing of the flavor of carbonated drinks. As we soon realized, this destroyed the flavor of our beers! It was a bummer, but at least there was still water, right…? The top of the summit is filled with stacked rocks, or nook-shooks, as we call them. Large, small, and in between, they were covering the top of the mountain. It was a fascinating sight to see. As we descended 6,000 feet down from the summit over the next 3 hours, we passed through the changing layers of vegetation. It was amazing to go from the rocky, snowy area of the summit in to the highlands, forest, and then jungle area! By the time we reached camp for night two, I had truly seen it all! The only downfall of my day was a sprained ankle, but nothing a little tape and an ace bandage couldn’t fix! It made the remainder of the hike a little tougher, but I suppose it made me tougher, too. At camp on night two, we got a big surprise. As our dessert, they came out with flaming bananas! They used a local “Inca Tequila” around the chocolate and banana to create a beautiful, tantalizing dessert! It was as delicious as it looked! The mules carry the camp and cook gear to the next camp that we will stay at. The men that lead them make our days trek in 3-5 hours, showing just how acclimated they are to living at such high altitudes. We walked along this river all the way to Aguas Caliented. Some parts were thin and shallow, others pooled with fish, and some flowing wide and smoothly. Every step of the way, it was beautiful. The local hot springs in Santa Teresa. 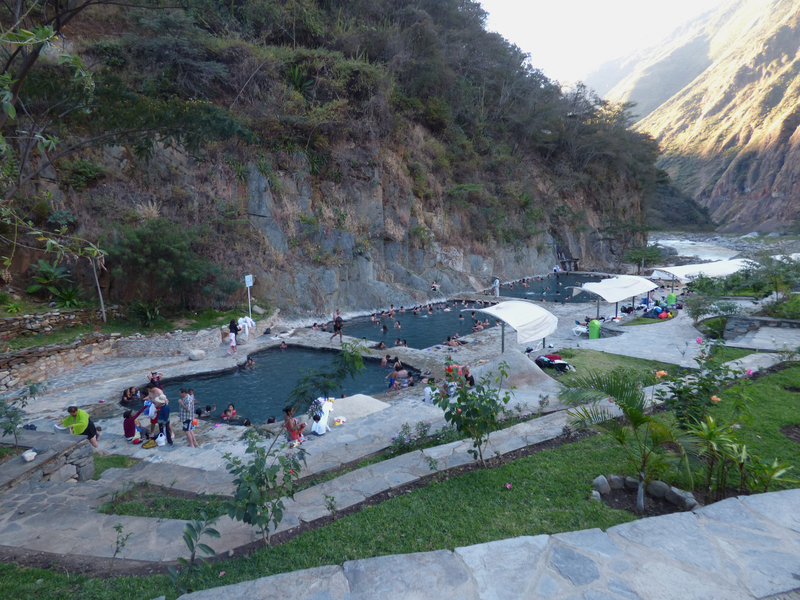 They are the best hot springs in the area, from Cusco to Santa Teresa to Aguas Calientes! Days four and five were amazing! 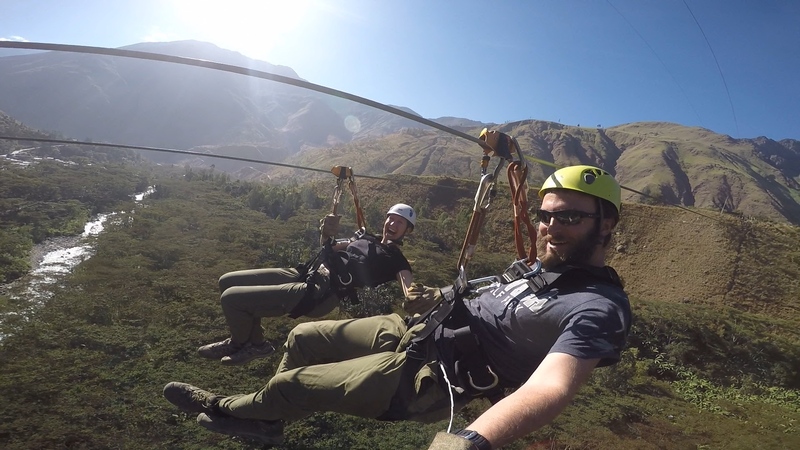 On day four, we followed zip-lining with hiking to Aguas Calientes for the final night’s stay. 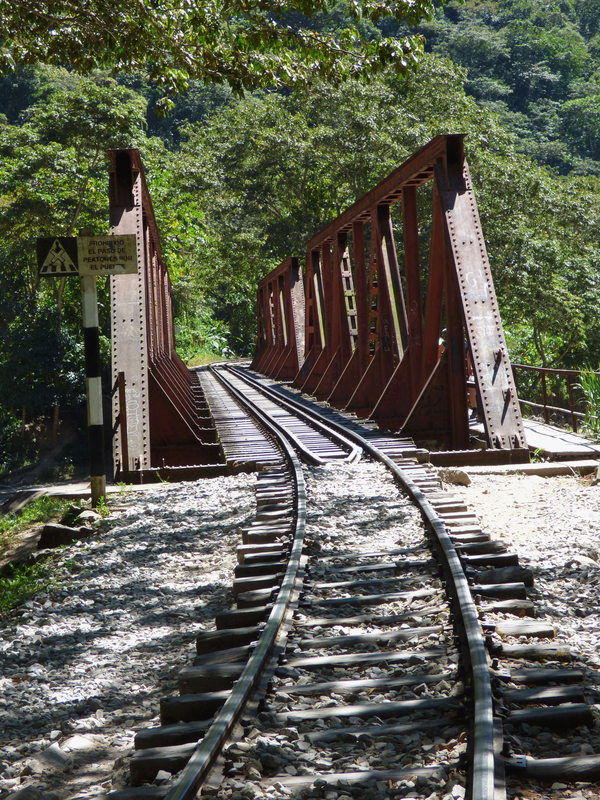 Before we could hike, however, we had to take a colectivo bus to the tracks from the zip-lining company. It was life-changing. Never again will I flip off a bad driver in America or get nervous on a sketchy dirt road. 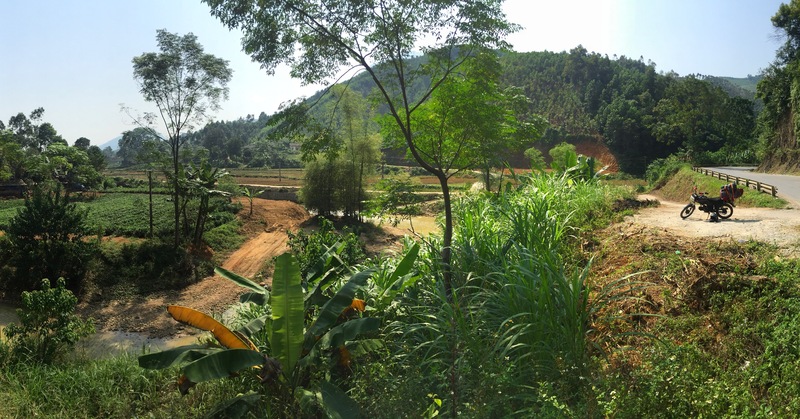 The over-filled colectivo sped down the one lane dirt road, inches from the cliff’s edge! Ironically enough, “Staying Alive” was blaring through the speakers as the landscape flew by in a blur of green and brown. Quite a few times, the mountain streams crossed the dirt road and I could feel the bus lose traction the slightest bit as the driver didn’t bother to slow down. As my life flashed before my eyes, I prayed to make it to lunch alive and promised myself that I would be a more careful drive in the future. 20 minutes after the bus left, we somehow made it to the tracks. I hopped off and ran for the trail, no longer complaining about the soreness in my legs because, even sore, they were safer than that bus! 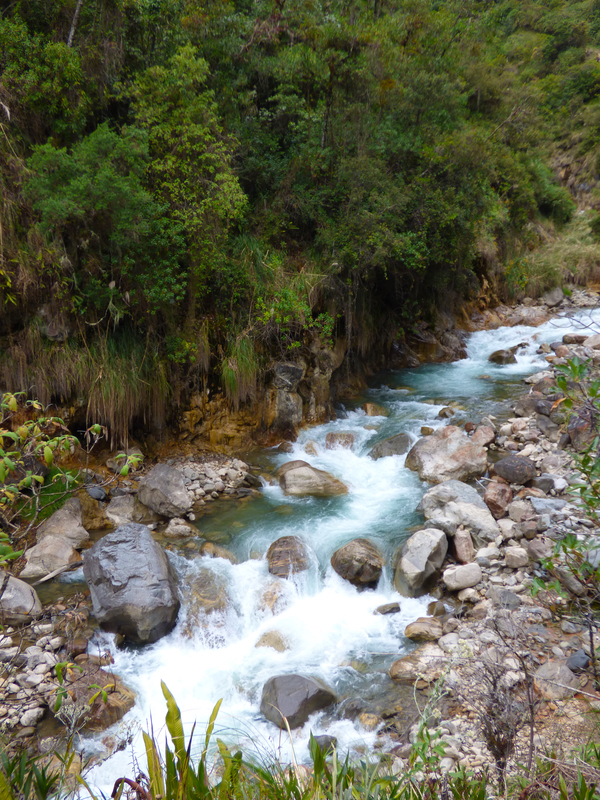 The walk to Aguas Calientes was absolutely stunning! We walked along the railroad tracks to town with the river on our right. It was incredibly peaceful. Instead of hustling as we had been the previous days, Chase and I walked, took more photos, and revelled every moment of the time together. It was a good three hours of walking, filled with bridge crossings, plant life, and stunning panoramics. When we arrived in Aguas Calientes, Gary, Chase, and I went out for celebratory mojitos to celebrate the end of our 60 kilometer trek. We had a few hours to relax and unwind before our group’s final dinner together. As dinner finally came around, Chase’s mom showed up to meet us and we were all reunited! It was great to visit and to see her feeling better after the altitude sickness. We had all been incredibly disappointed that she couldn’t make it to the trek and finally joining with her again was fabulous for all of us. After dinner, we all went to bed early to prepare for our early morning walk up the 1,000 steps to Machu Picchu. As I woke up to my alarm the next morning, I saw what 4 in the morning looked like. While I am an early riser by nature, that hour of the morning and I are not familiar with each other. As I shuffled around preparing to leave and packing all my bags, I decided that I wasn’t going to make getting up this early a regular occurrence. It is just not something I am fond of! We went downstairs, grabbed our sack breakfast, and took off walking in the dark. Chase and I had chosen to hike the 1,000 steps rather than take the bus, and it was the best decision we could have made! It was difficult, long, and sweaty. We also forgot water, so we had to simply focus on getting to the top so that we could buy some. As I do with many things, I treated the steps like a competition. I made it my goal to pass all of the people in front of my on the way up, ensuring that I was one of the first people in to Machu Picchu. Chase, the smart man he is, realized what went through my mind immediately and started hurrying to keep up with me as well. He wasn’t exactly thrilled with my speed up the stairs! 😉 Since we didn’t have any water, we didn’t need water breaks! As I basically sprinted up the steps, I passed 112 people. We were freaking exhausted at the top, but it had been well worth the hustle. 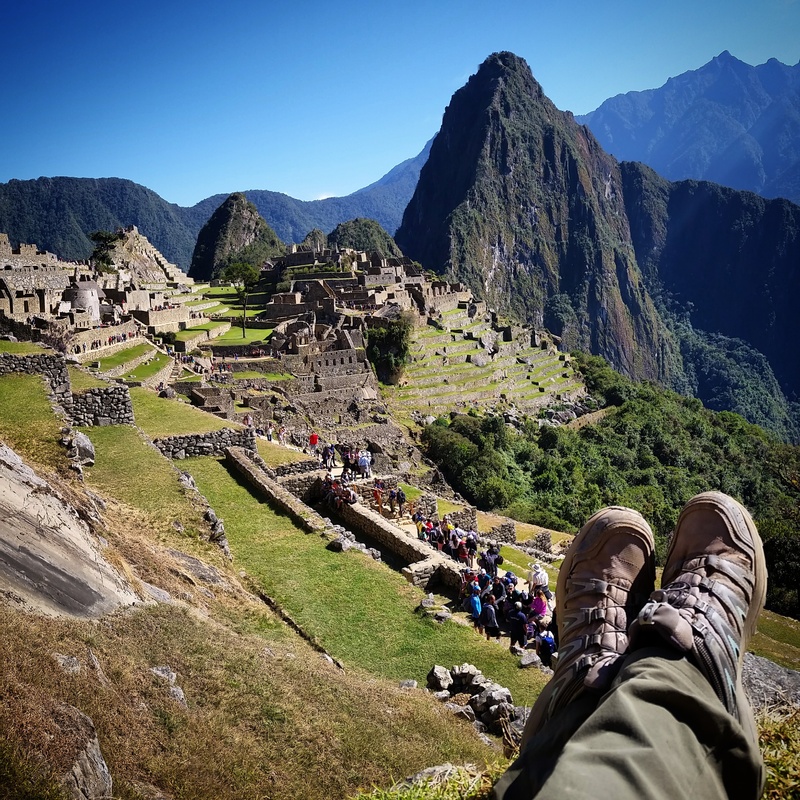 We were among the first people in to Machu Picchu and many of my photos are of the place while it is still empty! We sat on top of a view point we found and ate Oreo cookies as the sun rose over the horizon. We let the group start the tour without us so that we could sit and appreciate the moment. While they scurried off to tour the remainder of the area, Chase and I sat in peace. It was one of my favorite moments on this trip, and one I will forever hold dear. 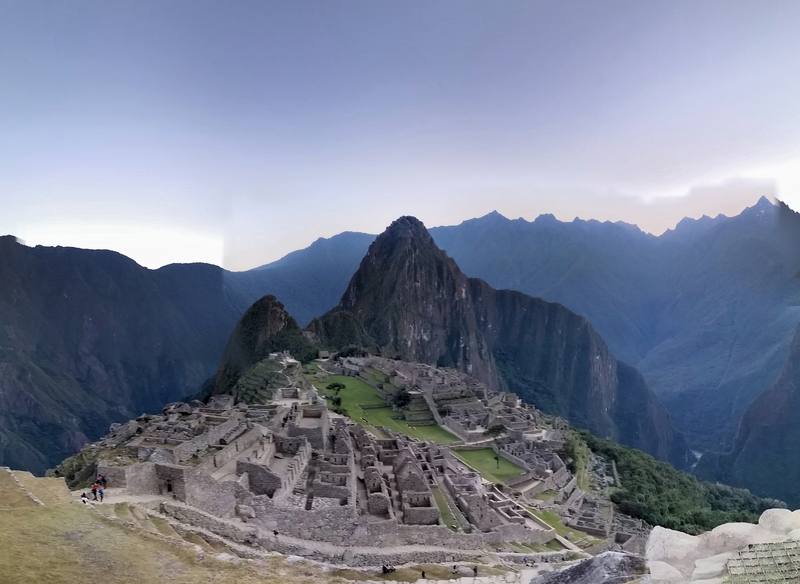 Machu Picchu in its entirety, right before sunrise. Still empty, peaceful, and beautiful. 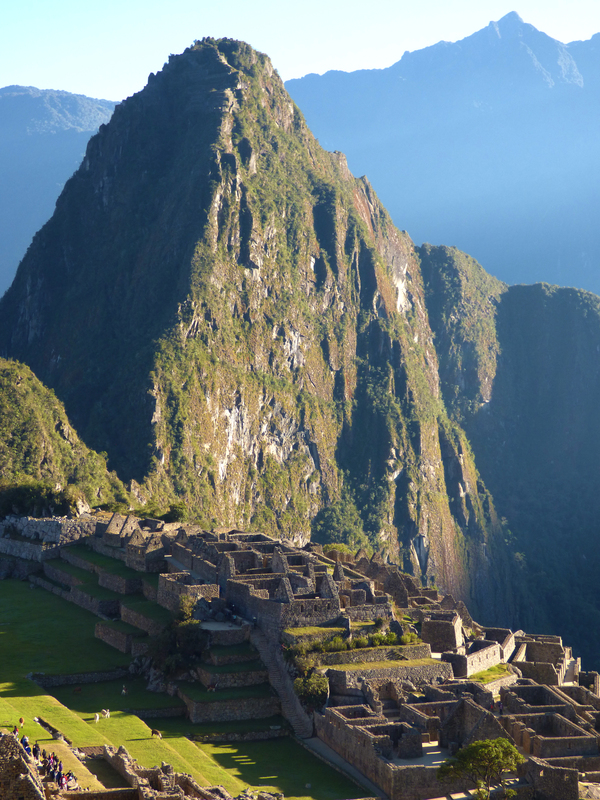 The rest of Machu Picchu was incredible. For one, I didn’t realize how massive of a city it was! We spent hours walking through the ruins, taking in all the history. Here are a few pictures to highlight what we saw! It was truly a once in a lifetime experience that shows just how far mankind and society has come. 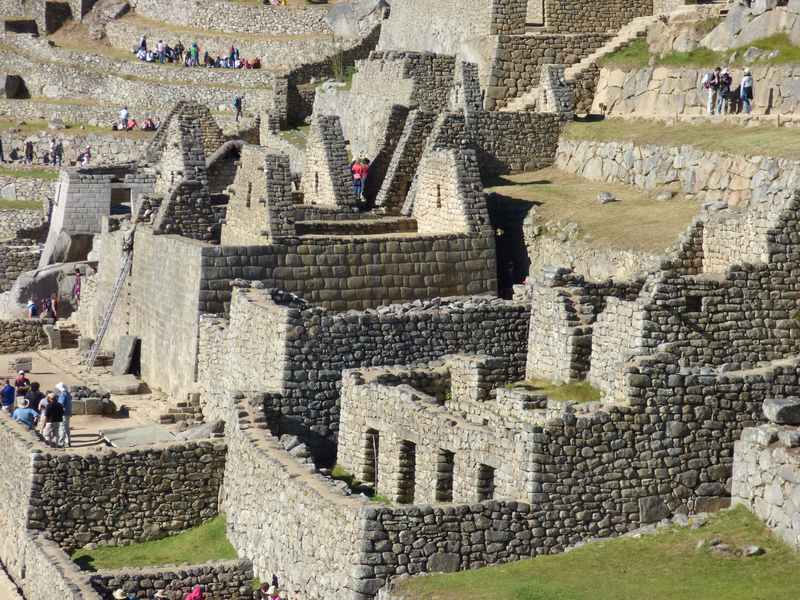 To look at these massive buildings, knowing that the wheel had not yet been invented, reflected on how the Inca society worked together, and did so well. Instead of slaves, the entire society contributed and worked. Imagine how well things would go if that concept carried in to today!!! 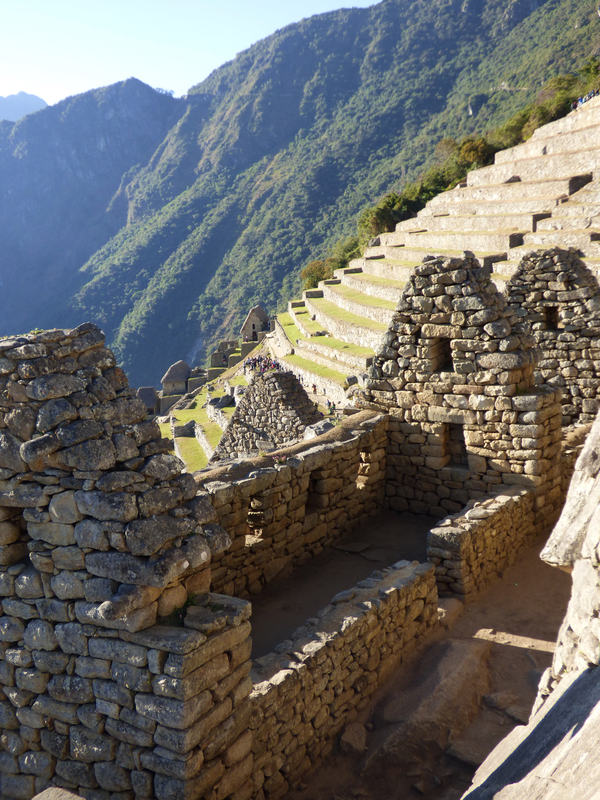 Wayna Picchu stands opposite Machu Picchu mountain above the plateau that Machu Picchu stands on. 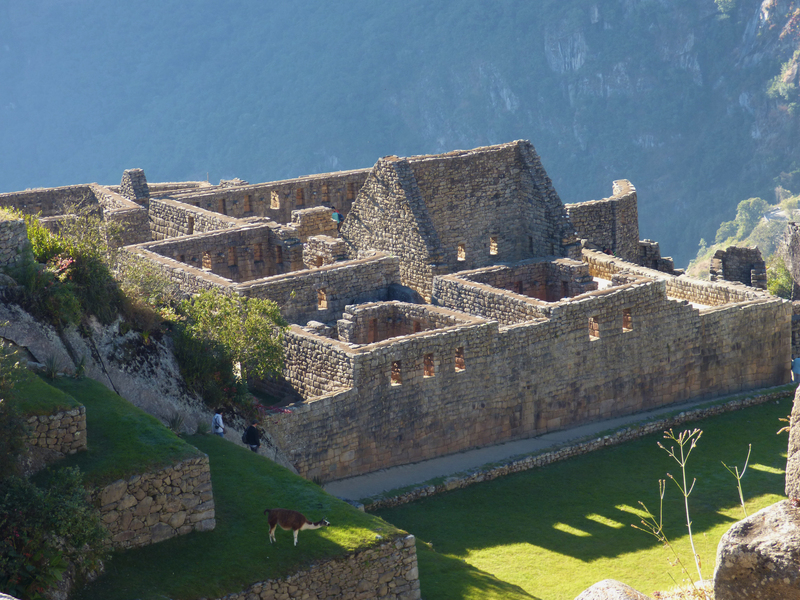 One of the many buildings of Machu Picchu basks in the sunllight as the morning drags on. The trip of a lifetime is definitely what describes this. To think that 4 months ago, we planned to stay in Chile and Argentina for the entire winter amazes me. Obviously some things changed, we caught the travel bug, and kept moving north. I will return to Chile and Argentina to ski, but I don’t regret coming north for all of these experiences at all. Praise the Lord!